From hotels and hospitals to restaurants and cafeterias, fresh ice is a must, and Manitowoc Ice is one of the best at making it. They manufacture some of the top ice makers in the foodservice industry, ranging from undercounter to standalone S models. There’s never really a good time for an ice machine to stop working. While it’s not a common occurrence with Manitowoc machines, a couple of issues can pop up occasionally when the unit runs on a daily basis. That’s why we have easy tips & tricks for troubleshooting a Manitowoc ice machine, so you can find and solve the problem quickly. Power supply – It’s the one question everyone sighs after hearing: “is the unit plugged in?” Just check. You might be pleasantly surprised that your problem has an easy, cost-free solution. Circuit breaker – Is the breaker tripped or a fuse blown? Check your box for these problems. Toggle switch – If the ON/OFF/WASH switch isn’t set properly, or is somehow stuck between those options, your machine won’t operate. Make sure the switch is set to ON. Damper – If the damper is held open in the down position, the machine will shut off until ice or any foreign obstructions are cleared. The damper must be upright and capable of swinging freely. Safety limit – The safety limit on some Manitowoc units is designed to stop the ice machine if there is a possibility of major component failure. Switch the machine off and back on again. If the ice machine continues to run, the condition has corrected itself and you’re good to go! If the machine stops again, the condition requires a service technician. 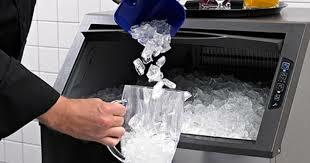 Cleanliness – Clean and sanitize the ice machine. Leveling – Is the ice machine level? Your unit must sit flat on the floor for optimal performance. Ambient air temperature – On air cooled models, the air temperature must be at least 40 degrees Fahrenheit or 4 degrees Celsius. Water regulating valve – On water cooled models, if the water regulating valve is leaking in harvest mode, it could cause a problem. Replace the valve. Timer – The harvest sequence cannot be initiated until a 6-minute freeze timer has elapsed. If ice forms before then, it will be held until the timer completes. Ice thickness probe – Is the probe dirty or disconnected? Does the ice thickness probe need adjustment? The water flow, not the ice, should contact the ice thickness probe to initiate harvest. Water quality – If your water quality is poor, there are many potentially expensive problems that can occur. Contact a qualified service company to test water quality and for the right filter recommendations. Water filters – If you already have a filtration system, your water filter may need replacing. Cleanliness – Lime scale can cause poor ice quality. Clean and sanitize your machine. Ice thickness probe – See if the ice thickness probe need adjustment. Water level – Make sure the water trough level isn’t too high or too low. 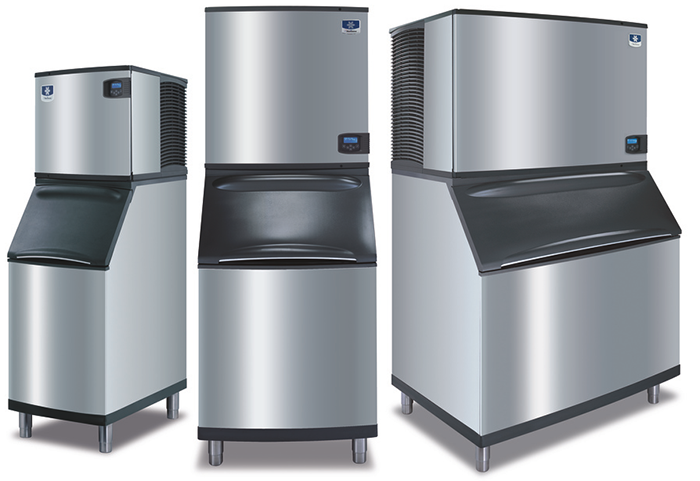 Water temperature – Ice machines require a cold water supply. Make sure there is not a hot water supply line into the machine. Filtration – The water filter may need to be replaced. Water pressure – The water pressure into the machine must be 20-80 psi (137.9-551.5 kPA). Water float valve – Check the water float valve’s filter screen, as it may need cleaning, and clean the water float valve itself. Both can cause an issue with shallow or incomplete ice cubes. Leveling – Make sure the machine is level. The machine must sit flat on the floor for optimal performance. Water supply – Is the water supply connected? Make sure the water service valve is open. Water float valve – Check the water float valve’s filter screen, as it may need cleaning, and clean the water float valve itself. Both can cause low ice capacity. Condenser – Make sure the condenser is clean and free of obstructions, especially in air-cooled models. Air temperature – The air temperature must not exceed 110 degrees Fahrenheit (43 degrees Celsius) in air-cooled models. Not finding the answer to your troubleshooting question? Please reach out to our Manitowoc Ice Brand Champion, Alex Hansen and he will be happy to assist.